^ Li, Paul Jen-kuei (1985). "The position of Atayal in the Austronesian family." In Li, Paul Jen-kuei. 2004. 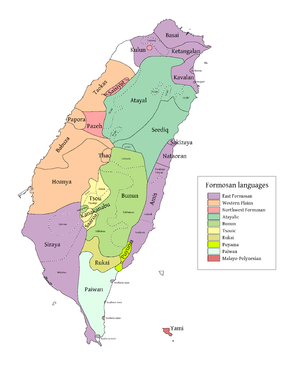 Selected Papers on Formosan Languages, vol. 2. Taipei, Taiwan: Institute of Linguistics, Academia Sinica. ^ "Ethnologue report for language code: ssf",2011,SIL International. ^ Ita Shao/邵族,"前進Puzi（土亭）" 存档副本. [2012-01-22]. （原始内容存档于2012-03-01）. ,P'ashtay pyakal'inkin,2012年查閱. ^ Li, Paul Jen-kuei. 2008. "Time perspective of Formosan Aborigines." In Sanchez-Mazas, Alicia ed. Past human migrations in East Asia: matching archaeology, linguistics and genetics. Taylor & Francis US. ^ 李壬癸(Paul Jen-kuei Li),"臺灣南島語言的語音符號(Orthographic Systems for Formosan Languages)",教育部教育研究委員會(Ministry of Education ROC),臺北市(Taipei),中華民國八十年五月(May 1991). Li, Paul Jen-kuei (2003). "The Internal Relationships of Six Western Plains Languages." In Li, Paul Jen-kuei. 2004. Selected Papers on Formosan Languages, vol. 2. Taipei, Taiwan: Institute of Linguistics, Academia Sinica.